Elizabeth Kerner was born in Florida but, as the daughter of a Navy doctor, spent much of her early life being moved around the United States. She started writing while in high school in New Orleans. She received her MA in English Language (Philology) from St. Andrews University in Scotland and spent a number of years as a non-fiction editor of medical and scientific books and journals. She now lives with her husband in Scotland. Here’s Elizabeth Kerner‘s website. The Tales of Lanen Kaelar — (1997-2004) Publisher: Lanen Kaelar has dreamed of dragons all her life. But not just dreaming, for Lanen believes in dragons. Her family mocks her that dragons are just a silly myth. A legend. But Lanen knows better. And she means to prove it. One day she sets out on a dangerous voyage to the remote West to find the land of the True Dragons. What she discovers is a land of real dragons more beautiful — and surprising — than any dream she could have imagined. Sometimes authors lose the plot. 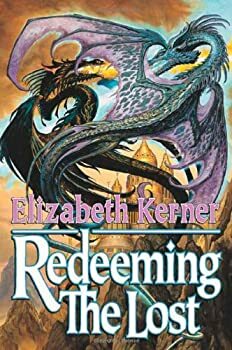 In Redeeming the Lost, Elizabeth Kerner loses... everything. She loses what restraint she had on her overly flowery writing style. It reached a point where some of the language was laughable and ridiculous, and often it looked like there were several words missing from sentences. Kerner is one of those fantasy authors that unfortunately can't fight the desire to show off her knowledge of archaic language. She loses the pacing. In actuality about 72 hours passes from start to finish of the book. Lanen has been kidnapped and so everyone... stands around and does nothing!? They chat and eat and mourn her kidnapping, but that's about it. And that redeeming the title mentions? Happens before 100 pages are up. And the way it's done makes no sense whatsoever, nor does Kerner offer up an explanation.